As my cold is lingering, I’m still not drinking wine, but being sick has left me thinking about my favorite comfort foods and the wines that go well with them. While obviously not a “sick” food, Hubby and I are suckers for a good Italian pasta dish. There is just something about how the warm pasta covered with rich sauce, spiced meat, and creamy cheese blends together; it makes me feel like I’m eating pure hearty, goodness. And, what goes better with a dish like that than a good Chianti? Several weeks ago, a opened a bottle of 2005 Banfi Chianti Classico Riserva to accompany Hubby’s favorite Italian dish–lasagna. 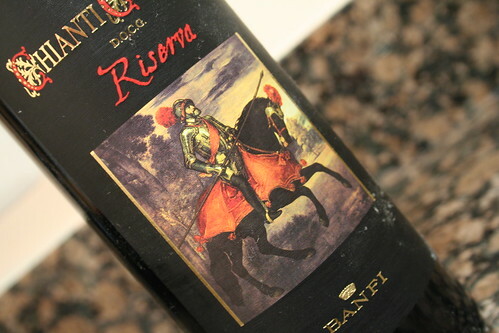 The 2005 Banfi Chianti Classico Riserva (winery, snooth) was made with Sangiovese, Canaiolo Nero, and Cabernet Sauvignon grapes and was a medium-to-dark ruby. On the nose there were cherry, vanilla, smoke, and tobacco aromas. In the mouth, there were cherry, tobacco, vanilla, powdered chocolate, and spice flavors. The wine had a high acidity and medium tannins, with a surprisingly thin body. Is this worth a glass after work? Eh…if you have a bottle on hand, drink it, but I wouldn’t go searching it out either. At $15, the Chianti had a good acidity that paired well with tomato sauce, but the body of the wine was too thin for it to be something spectacular. I definitely enjoyed the wine more when I paired it with the lasagna and with pizza, as the wine felt a little thin and harsh on its own. In general, though, while I wouldn’t pour this wine down the sink, I think there are other Chiantis out there that have more to offer a piece of homemade lasagna.